I know this post is a bit late. Stupid servant belly-aching about her belly. Oh well, every day should be Caturday anyway. When Natural Balance began selling Fat Cat and Fat Dog food, the company offered the servant the chance to try the food and giveaway a coupon for a loyal reader. The beast, the servant says, is in good shape. I perhaps could lose a bit of weight. So the servant picked up a bag of this Fat Cat food. Fat Cat and Fat Dog, I'm told, are designed to help pets specifically to lose weight or maintain it. It has less calories than the reduced calorie food. I like it because it tastes like chicken and salmon, which I like. Plus, I don't need to eat much to feel food. The servant gives me about 3/4 of a cup, and I graze on it throughout the day. Of course, I am not losing as much weight as I should, because I still demand my Natural Balance Platefuls pouches every once in a while. I just eat less dry food. I am looking a lot better. Of course, I'm still fighting the servant on using the yellow thing she got from Natural Balance. But she did put me on the scale today, and I am down to 15 lbs. Not bad. Everyone else notices I'm not so much of a fat cat as I was either. Still, I have a ways to go. I might need to have the servant reduce my food. Galadriel took to the food very well. She likes it a lot. I have seen noticeable loss in her size. You can adjust food according to what else your pet needs in their diet. There is only kibble. So if your pet doesn't eat kibble, this will not work for you. You need to keep a good notes to make sure you see proper weight loss, that way you can make adjustments. The diet works best when you increase exercise. This has been crazy tough with Galadriel. DISCLAIMER: Natural Balance provided me with the free coupon to give away. Every thought in the review, however, is my own. My Reese's (tortoise shell cat) needs help losing weight. My dogs Kita and Kota need to loose some weight. They are large dogs but are old and need to loose some to get around better. My fat cat, Bubba, needs this food. He weighs 22lbs. My new rescue, a Springer Spaniel, could stand to lose some weight. My Dog need to lose weight. My 9 lb chihuahua refuses to walk - just lays on the sidewalk and won't move. So, she is getting NO exercise, but could sure use some. Our cat, Stewart, has gotten a little portly since we adopted him a couple of years ago. 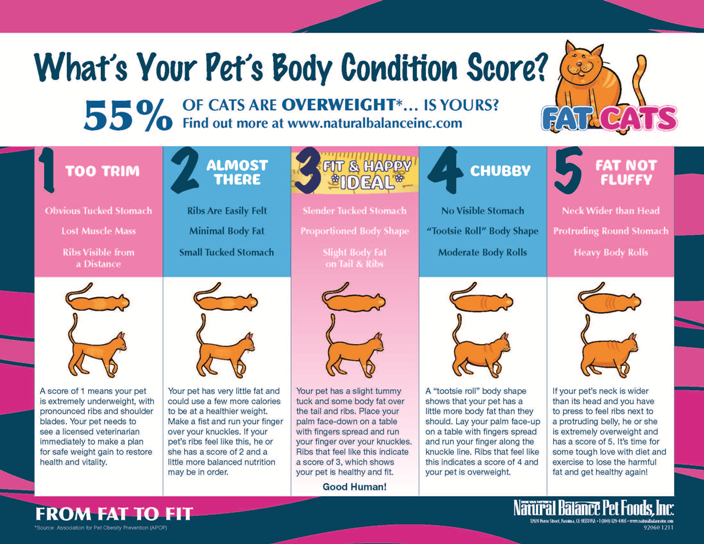 I admit I am very good at judging healthy weight in dogs but not so great at cats. my special dog's weight in line especially during the winter months when he is not able to be as active. My Chihuahua needs to lose some weight. My cat should lose some weight.